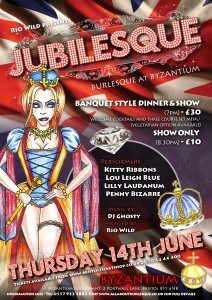 On Thursday, June 14th, Rio Wild will be hosting an evening of burlesque at Bristol restaurant Byzantium to celebrate the Queen’s Jubilee, entitled “Jubilesque”. The evening will feature seven performances by five fantastic burlesque performers: Kitty Ribbons, Lou Leigh Blue, Lilly Laudanum, Penny Bizarre and Cherrybomb Derriere – and will begin with the national anthem, and end with a toast to the Queen. Host Rio Wild has worked with Byzantium’s head chef Rob Curtis to provide a menu in keeping with the Royal Jubilee theme: a three course menu featuring smoked salmon blinis with cream cheese and chive, Coronation Chicken with coconut scented rice, and Turkish Delight and coffee to end. There is also a vegetarian option available – please advise the restaurant when booking if this option is required. Tickets are only £30 for three‐course dinner and show and £10 for show only (tables of 10 will receive a discount), available from the Bristol Ticket Shop, Pins N Needles Tattoo in Lawrence Hill, Byzantium and through the Rio Wild website. Doors will open at 7pm for diners (dinner at 7.30) and at 8.30pm for those watching the show, which will begin at 9pm.